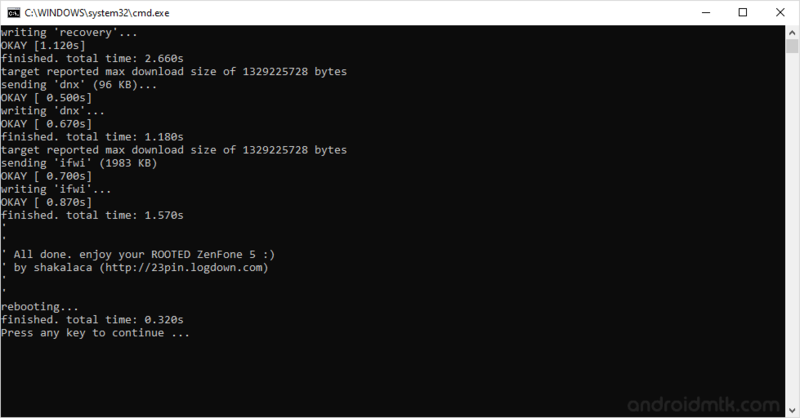 These are the instructions to root Asus Zenfone 5 running on android 4.4.2 using Zenfone5 rootkit on windows computer. Requirements: Your device should have at least 30-40 percent of device battery to perform the rooting process. Step 1: Download and install Asus Zenfone 5 usb driver on your computer. Step 2: Enable USB Debugging on your Asus Device. To enable USB Debugging: Open Settings > Developers Option > USB Debugging > Tick to enable. Step 3: Now, connect your Asus Zenfone 5 to the computer. Step 5: Now, Open Root-ZenFone.bat (found in the Zenfone5 rootkit folder). Step 6: Once Root-ZenFone.bat is opened, you will be able to see the following screen. Step 7: Now, Press any key from your keyboard to begin the rooting process. Step 8: During the root process your device will reboot 5-6 times. And at the last you will be able to see the success message. Step 9: Now, your Asus Zenfone 5 is rooted successfully. To verify this open your device and search for the SuperSU icon in the App Drawer. [*] Backup: Please take a backup of your important data as rooting may delete your personal data. Backup also help you to recover your data whenever anything wrong happens in the rooting process. [*] How to survive root access: During OTA updates you may lost the root access. To avoid this situation, Open SuperSU > Settings > Enable Pro (you have to purchase the SuperSU Pro from PlayStore) > Enable Survival Mode. [*] How to Unroot: To untoot, Open SuperSU on your Device > Settings > Full Unroot. [*] Credits: The Zenfone5 rootkit was created by shakalaca (developer), so full credits goes to the developer.